Why choose Ausmove when moving to Australia from New Zealand? We are the moving to Australia specialists! For 25 years we have been your number 1 moving company in Auckland, successfully moving Kiwis across the Tasman since 1993. During this time we have shipped vehicles to Australia, transported dogs and cats, and all sorts of other household and personal effects to all parts of Australia. We pride ourselves on maintaining a high level of customer service, starting with your initial enquiry through to delivery in Australia. Our moving consultants strive to be as informative as possible and provide you with a detailed 'no surprises' quote, along with continued help and guidance throughout the moving process. Our professional packing crews are fully trained in all aspects of international packing and will limit the stress involved with such a big move. In Australia, our agents have the resources and experience to continue our quality international moving service right through to your Aussie door, including the removal of used boxes and packing material. So why not get a quote on relocating to Australia from Ausmove and let us show you why we're the trusted moving company for Aucklanders and wider New Zealand. Anzac Day occurs on 25 April. It commemorates all New Zealanders and Australians killed in war and also honours returned servicemen and women. We think it's an extremely worthwhile cause. Ausmove's donation will be used for the welfare of former and current servicemen and women, their spouses or partners, widows, widowers and dependants for doctors’ fees and dental costs, through to specialist surgery. 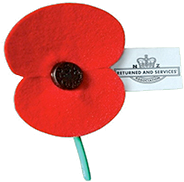 You can donate by texting POPPY to 4662 to make a $3 donation to our RSA Poppy Appeal or donate online.